ESTA-NY.com uses the Employment Supports Transformation Assessment (ESTA) as well as individualized tools, resources, and guidance to help human services agencies transform employment supports. The Transformation Trail is a map to navigate your progress. It portrays the steps organizations often take in the process of transforming employment supports. It also identifies the tools and resources offered by ESTA-NY.com that can be helpful. Consider the markers on the trail as individual signposts in the transformation journey. The FAQs page provides guidance and answers to common questions related to how to use this website and its tools to assist your organization. Esther will offer you tips for using the website in ways that work best for your agency. Learn more about ESTA-NY.com: Check out the FAQs, which provide guidance and answers to common questions about using the ESTA-NY.com website and its tools to assist your organization. Take the first step: Understanding Transformation and Culture Change. Often the first step in initiating transformation of employment supports is to evaluate and change agency culture. We recommend that you begin by exploring the resources and tools offered here. Accomplishing comprehensive transformation requires change at every level of the organization. 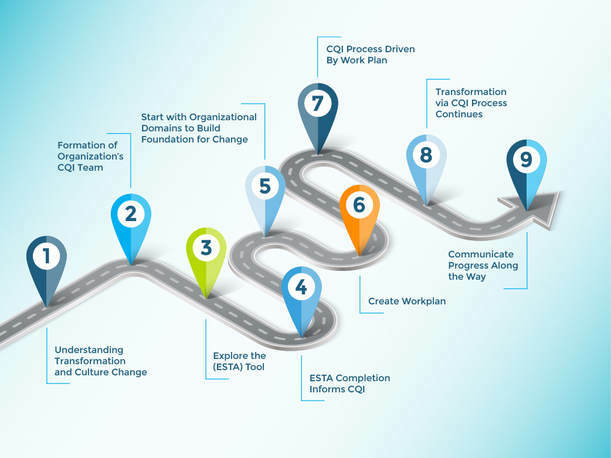 Use the Tools and Processes under ESTA Domains to facilitate a team process within your organization. There are many resources available to inform your transformation process. Check out the library of information provided under the Resources tab to learn more. We invite you to share resources that you discover with the field; add to the ESTA-NY.com library by emailing suggestions to [email address].